We had Allen Palmer (back from Paris;-), Robert Garner (back from the eclipse in Turkey), Grant Saviers (back from the over stocked surplus warehouse;-)), Glenn Lea, Chuck Kantmann, Bob Crane, Frank King (well tanned from somewhere), Ron Williams (back from a prank? ), Ed Thelen (back). Grant brought in a lap top - to be permanently resident (green card). Santa also brought in a 11x17 inch scanner and Palm organizer. The card storage cabinets are held ransom by the current wet weather. Ron Crane noted that the 2N1303 transistors we have been using like popcorn are *NOT* suitable replacements for type 102 and type 117 transistors. The 2N1303 are quite slow, the replacements should have been - for example 2N2894. This was discovered when replacing transistors in the Tape Adaptor Unit (TAU). Bob Feretich has been advised to look for about 9 2N1303 transistors already replaced into cards in the TAU. Ron also fixed some bad cards. This is a hint for figuring how to multiply in a machine that can only see two digits at a time. This timing chart *might* help. Robert Garner showed glorious photos of the occluded sun - and answered enveous questions. 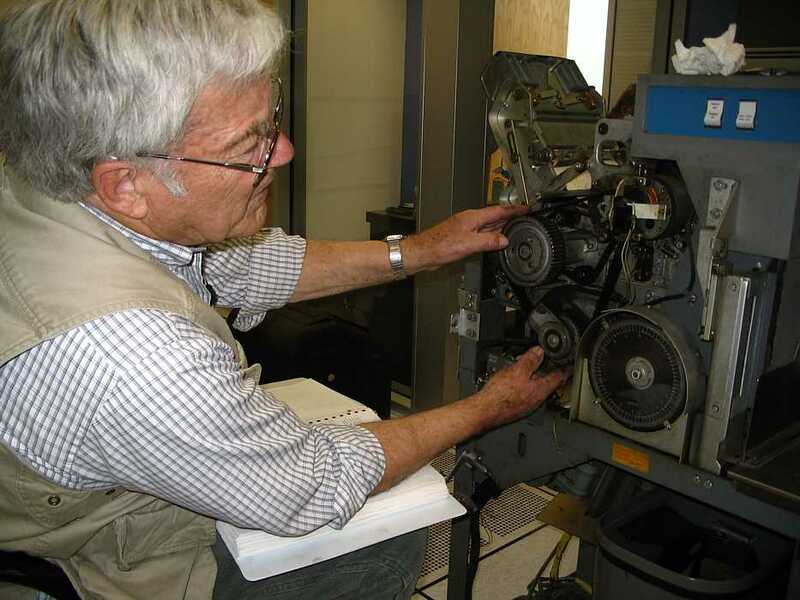 Allen Palmer declared sufficient victory (until the Tab Adaptor Unit works) on the first 729 tape drive to be restored. It has been wheeled to a different position close to the 1401. The next 729 is wheeled into the corner, here and the magnetic clutches removed. Allen and Grant disappeared, presumably to Grant's ranch to work on this set of squeeking clutches. - This is my low cost special, using ArcSoft PhotoStudio. Allen asks how to feed the new hair - Suggestions? 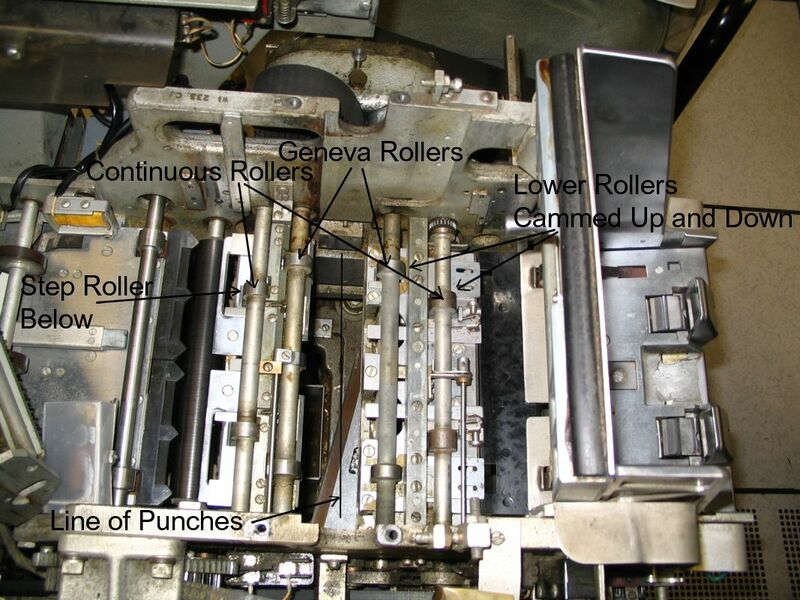 The 1402 card punch has a problem - it punches in the wrong row. Frank King figured this must be a timing problem. He and Ed Thelen scratched their heads - Ed is already bald - and watched cards going through the punch station a row at a time. 175 K Byte file The hand off of the card from the continuous roller to the Geneva gear controlled roller is much more complex than you might imagine - the lower roller of the continuous roller is levered up and down a few thousands of an inch at precise timings - like plus/minus 1 degree of a cycle. - and so on !! Bill Selemier and Randy Neff reading the new RPG and SPS source deck into a lap top. Note Bill's stripped shirt interacting with my pixelated camera ;-)) Later at that same station, Randy scanned some large RPG listings. Four of us worked 'till about 7. The new transistors work in the Trigger cards. The card Ron Crane repaired worked in the system. We replaced the 2N1303 on a second card on Thursday. It works now too. We are still using the 2N1303s and 2N1309s in circuits where the slow speed is desired. Thursday, we were able to get the TAU to write bursts of data and write continuously to the Tape Channel. In continuous mode, writing would continue until we activated the Disconnect switch on the CE Panel. I don't know if all of the control sequencing is exactly as shown on the timing diagrams, but at first glance, it looks good. After several minutes of writing continuous data, the VRC check light turns on. I suspect this is another transistor "breakdown voltage" problem like the one we saw with the "64 bit" of the Delay Counter. So far, all TAU testing has been done from the CE Panel. The basic selection hand-shake seems to work for all models of 729 drives at all density settings. The Rewind, Rewind-and-Unload, Write, and Disconnect operations appear to be working. The Analyzer has played a key role in permitting debug to proceed this far. We can continue to use it "as is" to build more confidence in the above operations. 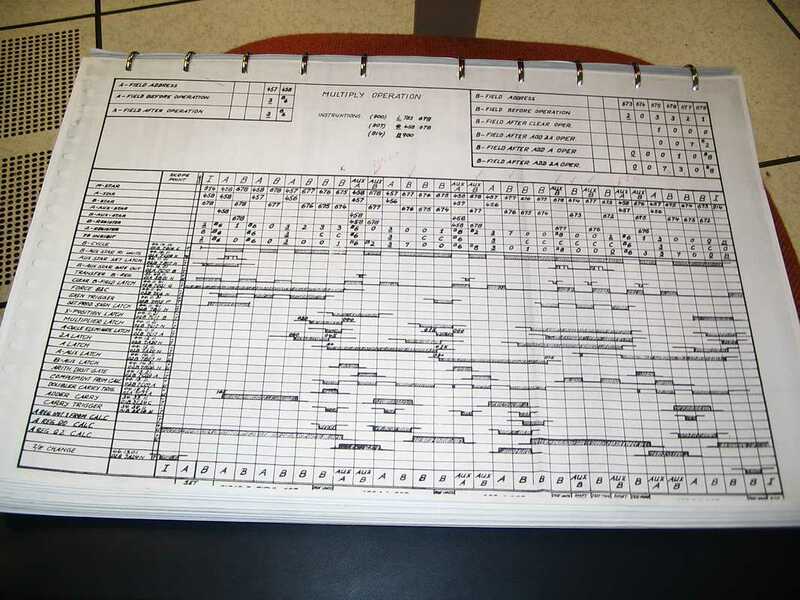 (I plan to use it in conjunction with the Logic Analyzer to create and verify interface and state timing diagrams.) We need to finish development of the Analog Board and PIC firmware to debug the Read and Backspace operations. We have succeeded in writing, assembling, linking, downloading, and running a "Hello World" program for the PIC. The PIC programmer we purchased was failing intermittently. Jeff Stutzman was able to repair it with a new programmer PIC chip and a bootloader he found on a Russian web site. We have learned quite a bit about the idiosyncrasies of the PIC firmware development environment. We plan to continue TAU debug next Thursday. Present were Ron Williams and Tim Coslet. All true - but a lot of that would have to be caught on a web cam - the printed page is rather limited. Robert Garner mentioned later "btw, web cams are nearly never humorous, but home movies are. :-) I/we need to start bringing my/our video recorders again! Life is sometimes a downer, especially when disconnecting and tagging about 30 wires to remove one 60 pound 729 power supply. The power supply provides +- 6 volts, +- 12 volts, + 7.2 volts, +48 volts, +150 volts. The extra wires are for external circuit breakers etc. back of reader There are lots and lots of belts in the 1402 reader punch - and they are not getting any younger!! Ron Williams and Chuck Kantman found another bad card in the multiply logic. - Like it had a burned 20 ohm resistor. 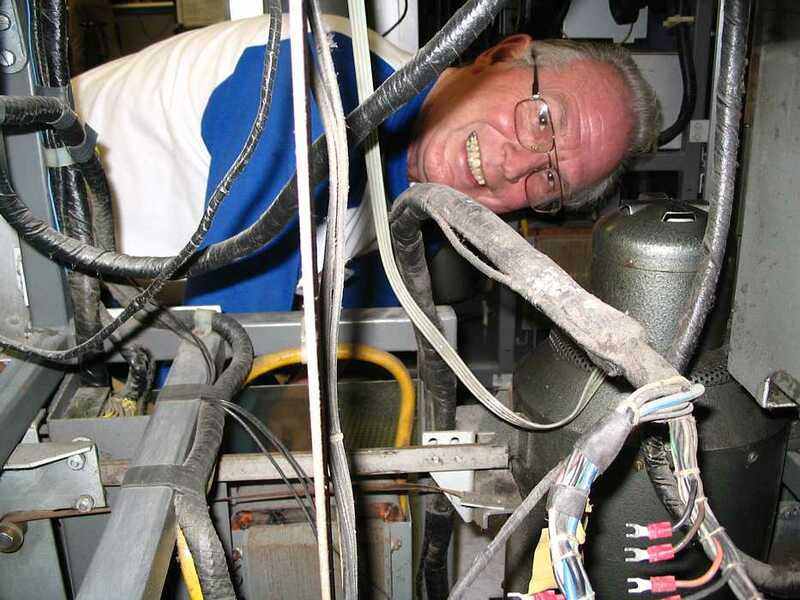 Ron Crane went to Halted for parts, and replaced the resistor and associated shorted transistor. Further testing next week. Randy Neff can get access to the museum's 12x17 inch scanner after hours, brings his own laptop to avoid password problems, and spent a few more hours scanning 1401 ALDs and other documents. 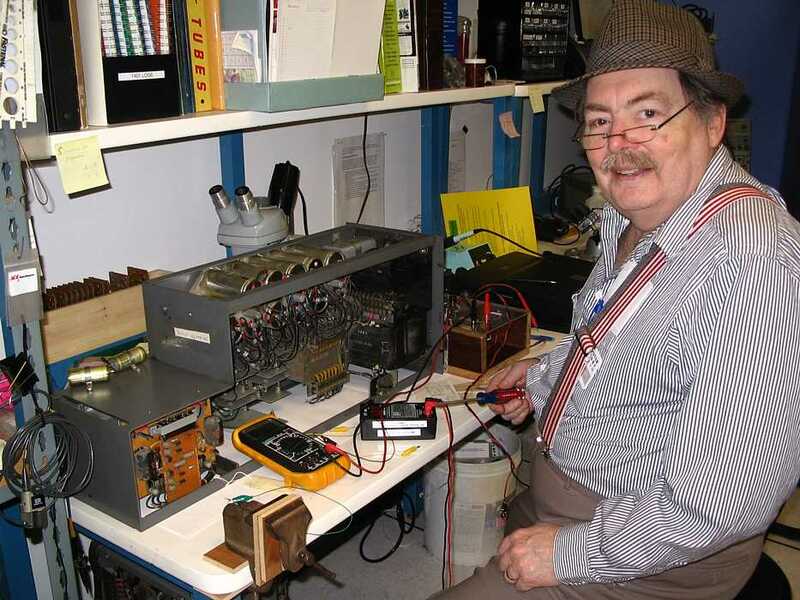 Ed Thelen is/was the official power supply tester. Here he is starting on 729 Red Dot. Present were Ron Williams and Ron Crane. This is one of four clutch sets going to Grant's machine shop to have new felts washers, new magnetic powder, installed and general clean-up and tune-up. One of a pair of capstain motors per drive. Note that the shaft extends when the electric current makes things magnetic, and the spring pushes it back when not energized (like during a rewind). These also are going for refurbishing to Grant's shop. Allen Palmer and Grant Saviers do most of this restoration. Here is most of Wednesday's crew in the CHM Volunteer Lunch Room. Around the table left to right - Allen Palmer, Bob Erickson, Ron Williams, Bill Flora, Don Cull, Grant Saviers, Tim Coslet (back of head). Glenn Lea is out getting a soft drink, and Ed Thelen is hiding behind the camera. Ron Williams, Bill Flora and Don Cull struggled with the 1401 which developed a case of "morning sickness" after working quite well the previous Saturday (See MYP works). card reader a movie of Brian's card reading program in action 1.5 megabytes Lincoln Labs, MIT sent us a card deck labeled "Thermal Defocus". Bill Selmeier read the five inch card deck (using Brian's card reader) into his laptop. Ron Mak, who came later, said the deck was FORTRAN II. We will send the deck and results back to Lincoln Labs. We analyzed the Programmer's schematic and determined that there is a design mistake that sends about 13.3 volts to the PIC. 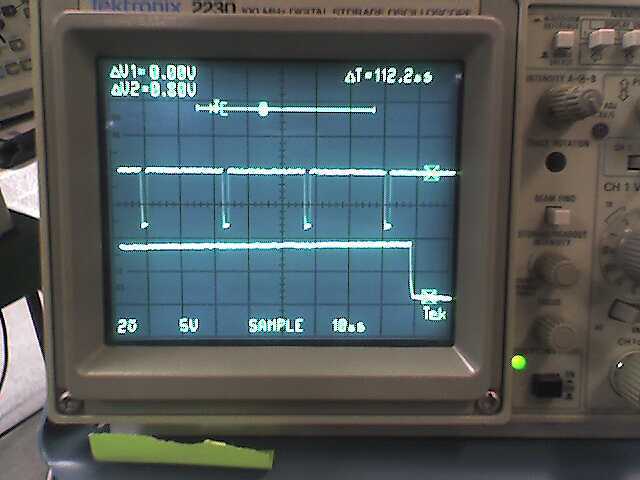 The PIC is supposed to be programmed using a voltage of 9 to 12 v, with 13.25v maximum. We have modified the Programmer to use 11.8v. We observed the programming operation using the sampling storage scope. The programming signals look clean and the bit pattern samples appear valid. Jeff will procure a replacement PIC module. 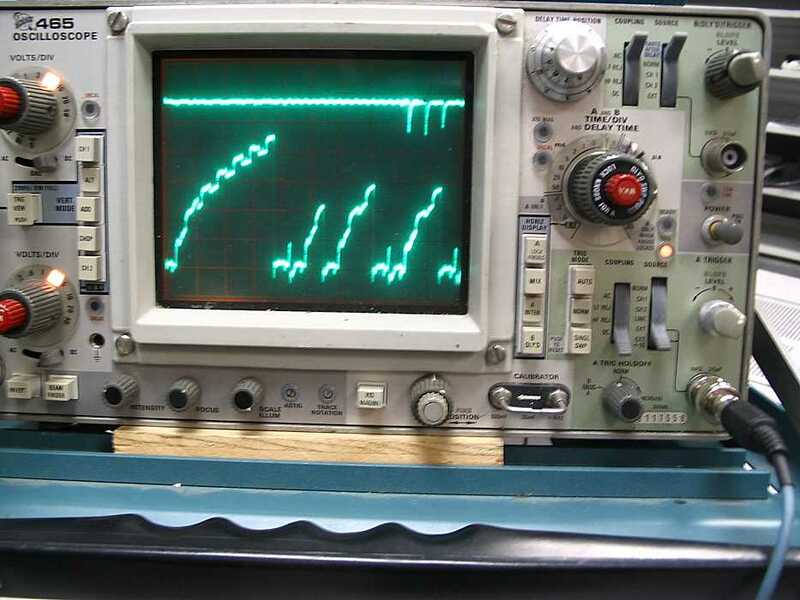 We verified the tape channel signal timings of CE Panel initiated tape write operations. At 556cpi density, we observed a block of 13 write strobe pulses (a record of 13 characters). Each pulse was about 1.5 uSec wide at a 24 uSec period. The "write check char" signal went inactive just before that first pulse and transitioned to active 96 uSec after the last write pulse. All of the above was within the envelope of the GO signal which became active 7.5 mSec before the first write pulse and inactive 3 mSec after the check character is written. These timings exactly match the documentation. We executed Tape Rewind and Tape Rewind&Unload instructions from the 1401. While debugging these instructions, we found an open diode. The effect of this bad diode was that the TAU would respond to non-tape instructions by interpreting data in the A-Reg as an action to be performed and, depending on this action, activating its BUSY signal back to the 1401. It is possible that this bug could have been confusing the overlap logic. 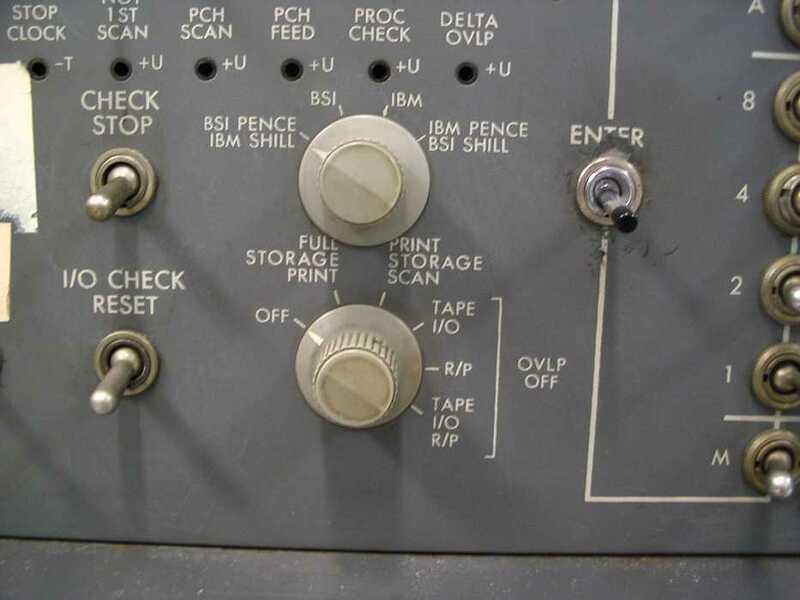 Our next objective is to perform a Tape Write instruction from the 1401. Once that works, we should attach the refurbished tape drive and see what happens. Present were Tim Coslet, Ron Williams, Ron Crane, Robert Garner, Ed Thelen. A box containing about 100 IBM transistors (maybe 20 big power transistors) had been delivered, addressed to Chuck Kantmann, from Bart Hancock. On the box was a notation "from San Jose Branch Office". Jeff Stutzman (who stayed till noon) separated these out by type, and Ed Thelen labeled some drawers for them. Ron Williams worked on the Overlap problem. 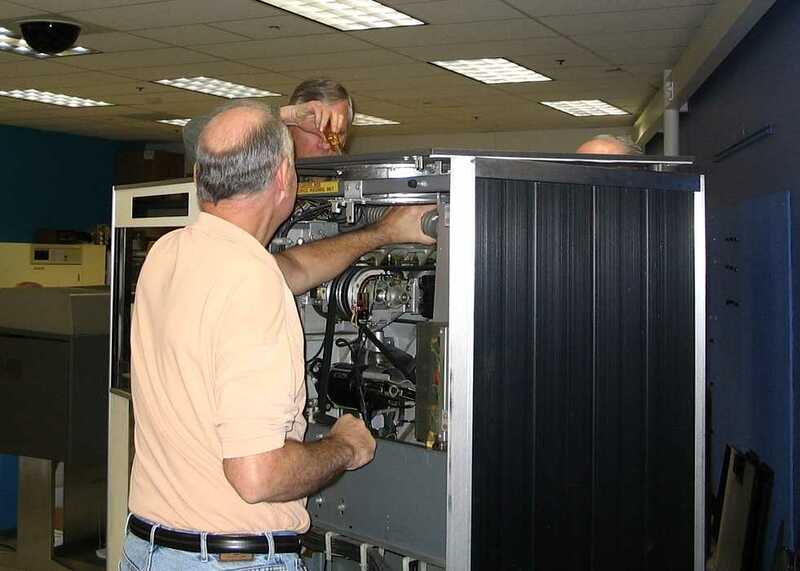 Ron Crane and Ed Thelen continued testing and exercising the power supply from the "red dot" 729 mod V tape drive. Al Kossow talked with several of us about looking for pre-1975 software, in card or tape form. Present (morning shift) were Ron Williams, Robert Garner, Allen Palmer, Glenn Lea, Frank King, Bob Erickson, Tim Coslet, Bill Flora, Ed Thelen. 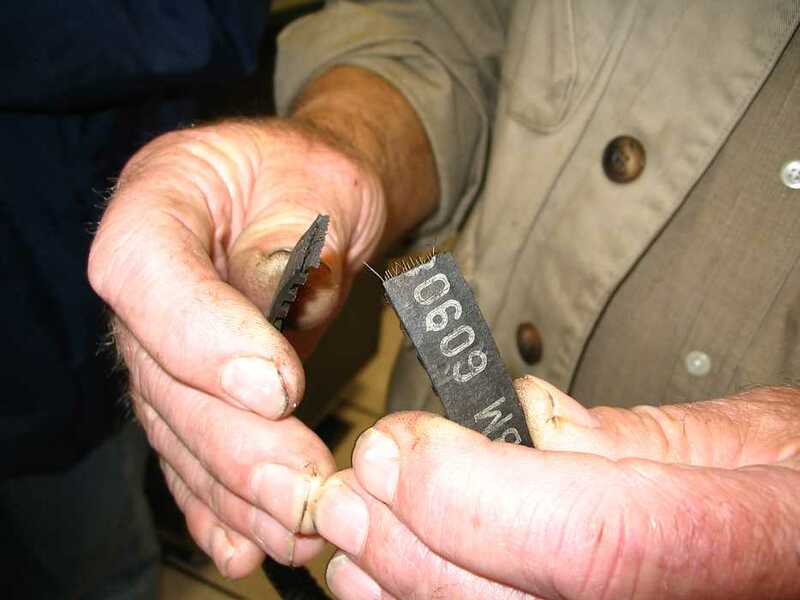 Bob Erickson (077 collator) found that the recent changes untimed the brushes. He retimed them, then found some unauthorized wiring changes in the comparitors (maybe to solve a local challenge?). He started making the machine more standard. Allen Palmer and Glenn Lea removed the power supplies from two of the remaining 729 tape drives for testing. 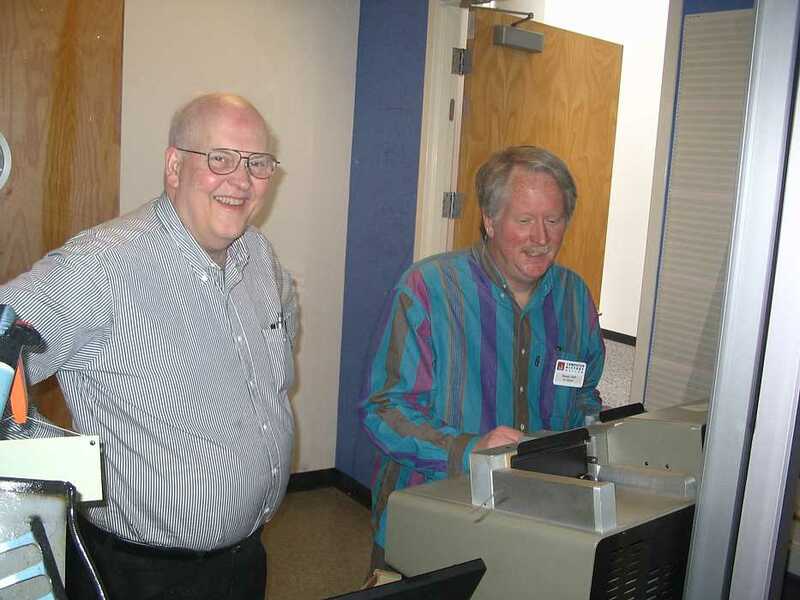 Ron Williams, Frank King and Bill Flora fed lots of cards through the 1402 card reader - checking the instruction overlap problem? 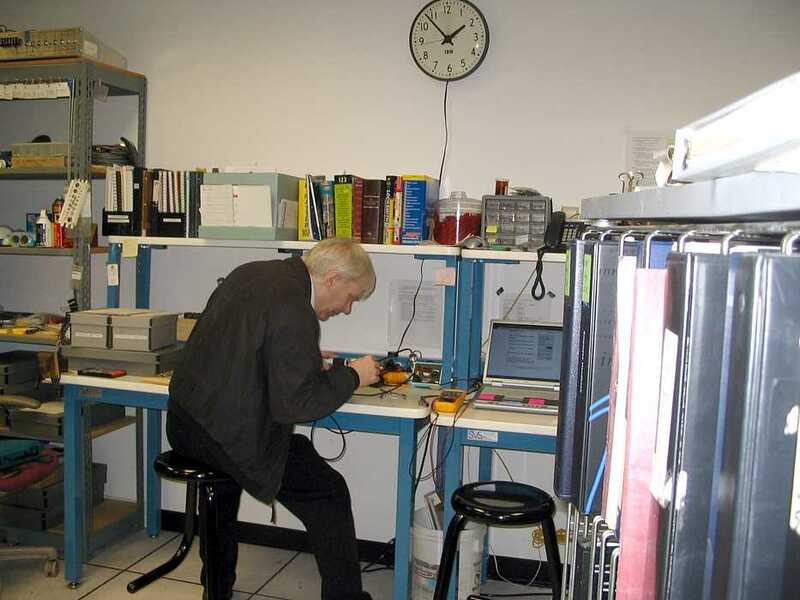 Tim Coslet and Ed Thelen resumed checking the power supplies for the "red" 729 mod V. We adjusted the voltages (some 15% off) and verified performance at partial and full rated loads. The + 6 volt regulator just would not hold a steady voltage - even under no load - the + 10 volts into the regulator was a lot more steady than the + 6 volts output which wavered up and down several tenths of a volt. We rotated the potentiometer that adjusted the voltage several times all the way in both directions to maybe clean it - but that did not seem to help. This pot is a two watt, 25 ohm unit not likely found at Radio Shack or Fry's. Many items from the estate were delivered to the museum on Thursday, including the scope, cart, and plug ins. Working with me were Ed Kramer, a close friend of Don's and former DEC & Thinking Machines executive, and Mike Miller, my ranch manager. Dave Dial, Julio, Ron Williams, Jeff Stutzman, and Bob Feretich were members of the unload team at the Museum. I was busy with moving and setting up the new "workshop", also equipped with many items that were Don's and thus the additional loose scope plug-ins (everything that was requested was picked up) and the scope manuals may not be in the right place (including still being on my truck). Please feel free to use these items and I will check Monday to see where the other parts are located, including the current probe. The blue tape means that we powered up that unit and that it seemed ok. No detailed function or performance tests were performed, so be aware of the units potentially being out of calibration. Ron Williams assembled the Vidmar cabinet drawers for storing 1401 spare modules and we moved it into the 1401 room. All 239 of the module types and total quantity should easily fit (although we forgot to configure a drawer for double wide modules). I will order some more dividers so each type has a labeled home. I am traveling next week and will not be in on Wed or Thurs. I also suggested to Dave Dial that an inventory of CHM owned restoration equipment might be helpful to share some resources among restoration efforts. David is arranging for restoration volunteers to have access to the workshop. A few more workshop items are yet to be moved, probably in a few weeks. Joe, thanks for the nice words, I will forward them to Sharon. PS 503 dual DC power supply. The Tektronix 7854 scope mainframe also had a blue-tape tag. May we use this item as well and could we have a set of vertical plug-ins and horizontal timebases ? Finally, I looked for, but did not find the A6302 current probe that connects to the AM 503, but it is probably with the other items. Thank you again for helping us out. 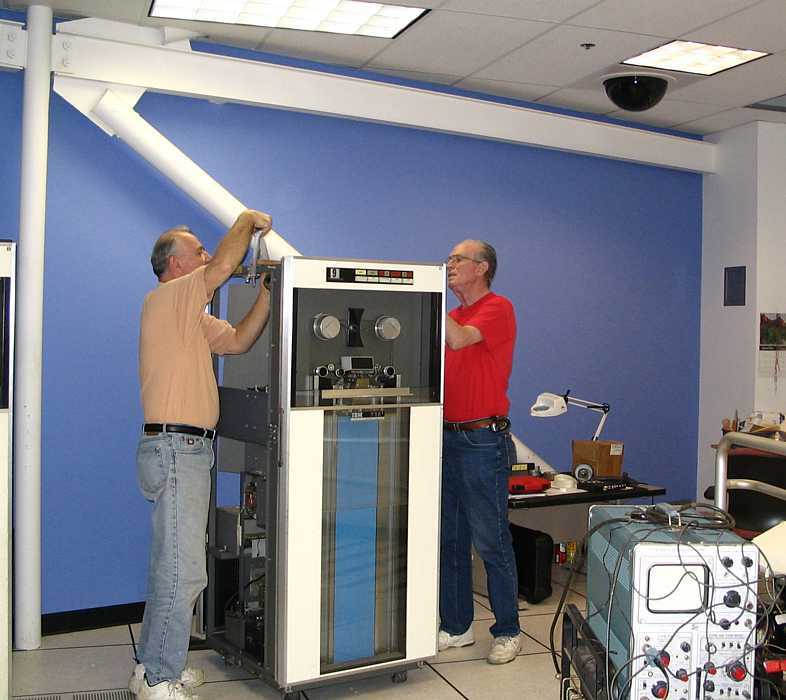 These instruments will help us continue in our work to keep the IBM 1620 and PDP-1 machines running, and help in future CHM restoration projects. Jeff and Dave Alessio each ordered and received the new Analyzer PIC modules. These modules are newer upward compatible versions of the one I originally ordered. The modules come with a crystal that makes them operate at 6 MIPS (compatible with the old module). The parts on the module are rated for higher speed operation, so Dave Alessio modified his to operate at 10 MIPS. If his proves stable at this speed, we will modify the other one also. The performance boost would give us better design margin in the interrupt services. Our old programmer was not successful in programming these new PICs. Previously, we were unsure whether our PIC module or Programmer was broken. We now know that the Programmer does not work. Jeff ordered a new and better programmer. We chased several red herrings yesterday. Several tests that we ran hung the 1401 CPU. Each diagnosis taught us a little more about CPU/TAU communication. Although we identified and fixed one hardware bug, generally, we believe that the observed results are correct machine operation. Using the Tape Analyzer, we were able to verify all critical interface timings of the Tape Write instruction. We were also able to loop these instructions at speed. Since the Analyzer does not yet have the ability to echo the write data, we needed to float a signal in the TAU to fool it into properly completing the write operation. We are getting diminishing returns from our current test environment. 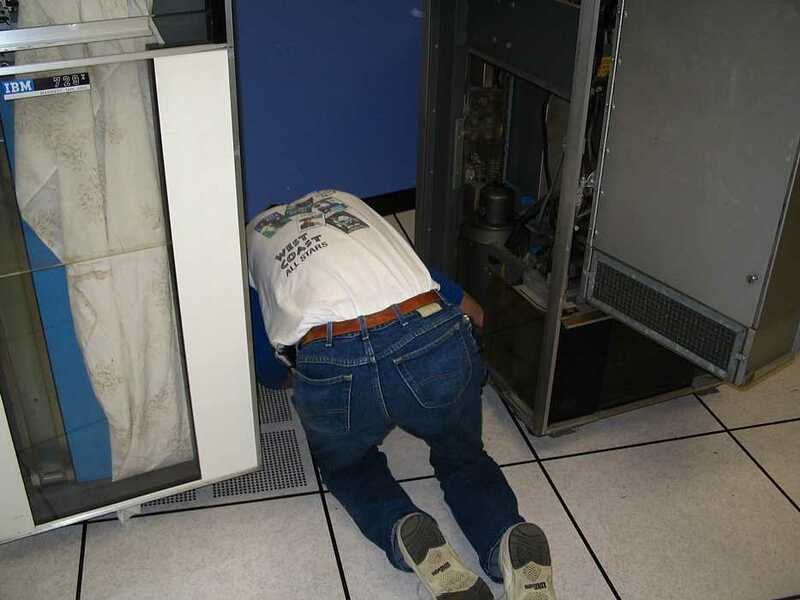 I plan to come in next Wednesday (probably afternoon) to prepare for connecting the refurbished tape drive. We will need the long tape data cable from "invisible storage" to connect the drive. 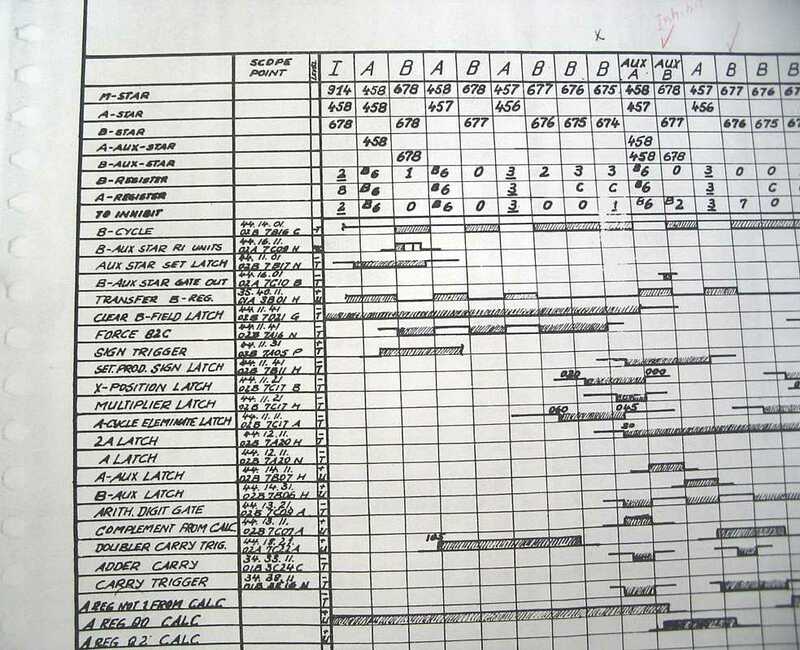 Specific details of the major herring chases are in the logbook. Dave Alessio took this picture of 1401 Tape Channel -N_Write_Pulses (top trace) framed with the TAU's Write_Cond trigger (bottom trace). The Write_Cond trigger is supposed to be on during the data transfer portion of a tape operation. This picture confirms that this logic is working properly.